Badgers are medium sized mammals which have broad heads, short strong legs and a bushy tail. Their front claws are long, designed for digging and they have a black patch on each cheek. There is a white line which runs over the top of their head which extends from its nose. Badgers average around 20 pounds but can exceed weights of 30 pounds if local food supplies allow for good growth. On average, males are larger than females. Badgers are found throughout much of the central and western states. Most every state west of the Mississippi has badgers; the open country of the plains states is where they prefer and seldom do populations exist where there are heavy forests. Badgers will readily live along coastal waterways and exist at altitudes in excess of three miles. 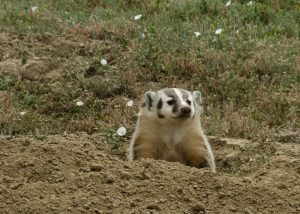 Badgers are members of the weasel family and have the characteristic “musky” odor associated with these animals. Either females or males will dig burrows but the females den will always be longer and deeper. This insures a protective environment for growing young. Badgers breed during the summer and fall but implantation of embryos are delayed; gestation begins around February and young are born in early spring. Litters average 3-5 animals. Offspring may begin to reproduce in their first year of life if born early but most will not until their second year. Badgers live an average of 6-9 years but it is not uncommon for them to live over 12 years in the wild. Badgers are carnivores. They will readily feed on ground nesting animals, their young, reptiles, amphibians or vegetables if meat is not readily available. Badgers have a keen sense of smell and will tract down any small ground living animal. 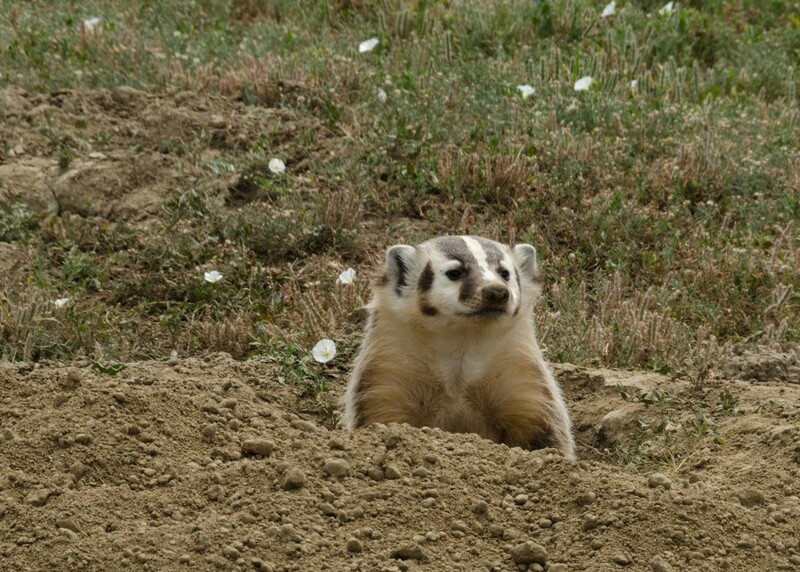 Once the animals nesting burrows are found, the hunting badger will dig and dig until it gets it’s dinner. 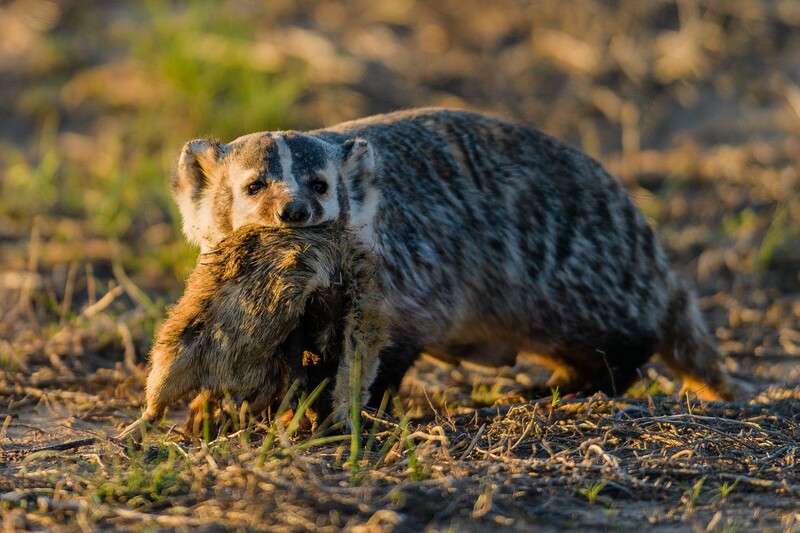 Badgers will thrive on gophers, chipmunks, ground squirrels, prairie dogs, chickens, turkey, young lambs, domestic dogs and cats and just about any small animal it can find. Badgers are mostly nocturnal and will cover vast areas in search of food. Though the average population of badgers may only be 1-2 per square mile, terrain with enough food can support 10-20 badgers without conflict. Badgers do not hibernate. Though they may go “dormant” for several weeks at a time, many of the animals they like to eat are active during winter. These animals provide a ready supply of food available year round; gophers, rats and other animals which are active even in snow provide nutrition during the coldest of winters. Though referred to as the “farmers friend”, badgers present more problems than remedies for farmers. The fact that they live on small animals has lead to a great many “urban legends”. The most common is that a badger feeding on rodents on your property will keep their numbers in check. This is not accurate. In fact, there is no documentation to support this belief. It has been noted, however, that badger activity is only present where there are large populations of small mammals. Generally, these populations have gotten too large which has led to the badgers finding them in the first place. In fact, small tolerable populations of those same small rodents might never get the attention of most opportunistic badgers. Since badgers need to eat often, they tend to follow a trail which leads them to populations which are high and dense. Badgers can be a problem around the home for a few reasons. The first is that they’re good diggers. If they smell a food supply in the ground like a mole, vole or gopher, they will dig and dig until they find their target. This can lead to extensive turf damage in the yard. Badgers will dig up grubs for food as well which again, can create quite a mess. If you suspect you have grubs in the yard, treating as explained in our GRUB CONTROL article can often times force the badgers to forage for food elsewhere. Badgers will routinely hunt small animals like cats and dogs as well as free roam chicken. They’ve been known to break into chicken coops and will prey upon a range of livestock. Badgers will target koi fish, frogs and other aquatic life kept in small ponds. They can clean out these areas overnight if left to forage as they want. Once a local badger finds your yard for any of the listed food above, its likely they’ll return on a regular basis. Badgers are tough and though shy by nature, they’re not one to back down from a simple confrontation with people. In general, once you have badgers active in the yard, you have a few choices to keep them away. The first option is to line your property with a repeller to keep them out of the yard. The second option is to trap the intruder. Trapping will allow you to destroy or relocate the animal which can sometimes be necessary to achieve long term control. But repelling them can be just as effective and in many cases, easier. Of course, taking away their food is another indirect way of getting them to stay away. So for example, if the badger is attracted to large populations of gophers on your property, implementing a gopher control program as explained in our GOPHER article will get them to reroute their foraging pattern. If the badger was attracted to your property because of CHIPMUNKS, GROUND SQUIRRELS or PRAIRIE DOGS, reducing their numbers as explained our respective articles will help by forcing the badgers elsewhere for food. For most homeowners, the best way to keep a badger from coming into your yard is to install our SOUND REPELLER. Badgers are super sensitive to sound and flashing lights. Our unit will effectively scare them away because they use both to alarm and frighten invading animals. Since badgers are generally nocturnal, you’ll need to set the unit to “night”. And if possible, running the unit via the included power supply brick would be best. This way the ultra sound will be heard by them from over 100 feet away and keep them far from the yard. The motion detector will be “N/A” and the audible sound can be turned all the way down to zero. By default the unit sends out ultra sound and the yellow knob should be set to point at armadillo (its not possible to list all animals on the unit but in this case, the armadillo setting is what works on badgers too). 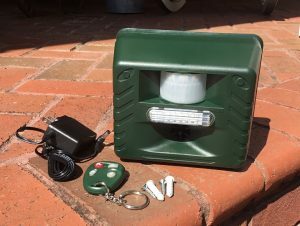 Now after a couple of weeks of using the device, you can decide to power it with batteries only and when set this way, the unit will only power on when the target animal comes within 30 feet of the device. For this configuration, you’ll need to slide the “Ultrasound” to “Motion”. The Motion Sensor Sensitivity should be on “30” and the Sonic Volume at “60-80”. The Frequency (yellow knob) should be pointing at the word “armadillo” as explained above and the “operating time” should be set to “night”. Our unit requires 4 “C” cell batteries when powering it this way which will last 2-4 months if not longer. It mostly depends on how much animal activity turns them on. Our unit also includes a wireless key so you can turn it “on/off” if you want to walk your pet or go out to walk around in the protected area. The motion detector will only sense motion for up to 30-40 feet away so make sure you have them placed where the intruder is known to enter. Once activated, the sound will be annoying to them for up to 75 feet and the audible sound can be disruptive for up to a football field away. This device will get rid of them for good immediately so its a quick and easy fix for most situations.Units should be placed 1-2 feet above ground and pointed in the direction where animals are entering as well as “over” the turf you want to protect. Badgers can also be repelled by spraying them with water. Using motion to activate the unit, our MOTION ACTIVATED WATER SPRAYER can be set out along property borders like the sound repellers but instead of using sound, they use water supplied by a garden hose. 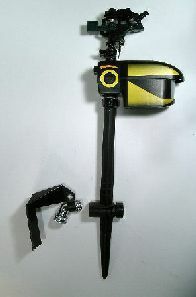 Units can be set up in series and will immediately chase away intruding animals. They will have to work around the clock though so if you need to turn them off for awhile, put a timer on the water supply so the water will not flow when you want them off. And for obvious reasons, they are subject to freezing when it gets cold so for most northern tier regions, the sound repeller is usually the better option for people in these areas. 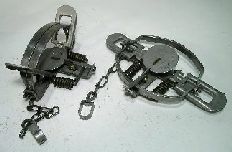 Live traps are one of the most common ways to catch a badger and are generally easy to use. Since badgers are territorial, removing the invading animal will usually get fast control of the problem. 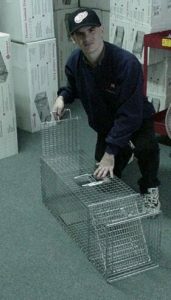 Once removed and relocated, you may not have another animal come around for a long time so there is generally no need to trap out several animals. To be successful, you need to use a trap large enough for the animal to be comfortable when entering. Our professional heavy duty LT111236 is both large enough and strong enough to contain a badger. Made with heavy gauge wire, this design will last for many years and can be used to trap most any animal in the 20-30 lb range. Since badgers will return nightly to any yard which is providing food, you just need to place the trap as close to the activity as you can. This trap measures 11″ wide by 12″ tall by 36″ long and it features a sliding rear door making it easy for both baiting and releasing trapped animals. 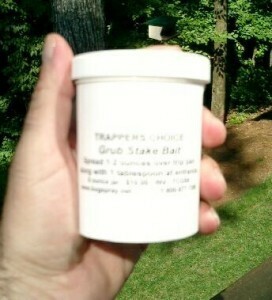 For trap lure, use either FISH PASTE or GRUB PASTE. If the activity is close to water, like a pond or stream, the Fish paste will be the way to go. Our paste is made from real fish and badgers cannot resist the offering. Use 1 tablespoon placed in a small cup or non porous plate just behind the trip pan and be sure to smear a teaspoon full on the trip pan too. But if they’re digging in your yard for grubs, use our GRUB PASTE. Put a teaspoonful on the trip pan and smear it around. Next, place a tablespoon behind the trip pan in a cup or non porous plate. Another trap that works well for when you know where the badger lives is the LT11236BD. Known as the “bottom door” trap, this design is made for placing directly over entrance/exit holes of animals like woodchucks, marmot, gophers, prairie dogs and badgers. So if you know where the den is located, this trap could be the easiest way to go. Just place it over the hole, secure the trap by placing a heavy log or cement bricks on top and let it lie. Make the set during the day and be sure to inspect the trap every morning. Exiting badgers will have no choice but to move up and into the holding area of the cage where they will get caught. There is no need to use bait for this trap either since they’ll naturally trip the set once inside. This trap measures 11″ wide by 12″ tall by 36″ long. It also features sliding doors on both sides so you can use it as a standard front entrance trap too. And the back sliding door allows for easy animal release. 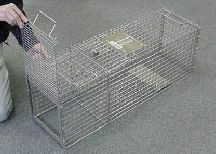 Another type of live trap commonly used for badgers are leghold traps. These have been used for hundreds of years and come in two styles. The BRIDGER #3 LEG HOLD design is the original style that has been around since the beginning of the furrier age.Just lay them out in areas where badgers are actively moving. You may want to place some fish paste around the set to get the badger to linger. Conceal the trap with leaves or grass and if the animal steps on the trigger, he’ll get caught. This trap must be anchored to either a strong tree or heavy log. Badgers are strong and failure to secure the trap means it will surely be dragged away. More recently, the COIL #3 or the COIL #5 trap has become just as popular. Essentially they use the same type of jaw to secure the animal but they do use a different spring mechanism to keep the jaws closed. The #3 traps will be plenty big for most any badger. But if you have reason to believe the animal might be 30 lbs or more, get the #5 coil trap. Keep in mind badgers are very strong so simply staking the trap to the ground will not hold them in place. Badgers will readily dislodge any stake so do not use these unless you’re able to secure the trap to a tree or some other immobile object. I have a badger problem as well as a gopher problem. Will the badger setting for the ultrasound repeller bother my dogs or horses? Are badgers a threat to humans? Especially children. If you do some searches looking for “badger attacks”, you’ll find many stories, reports and a lot of video showing badgers routinely taking on any animal including man. Now are they out and about looking to feed on or attack people? I’m pretty sure the answer to that question is no. But if conflict should arise, they won’t back down. And this will apply to a child or adult.